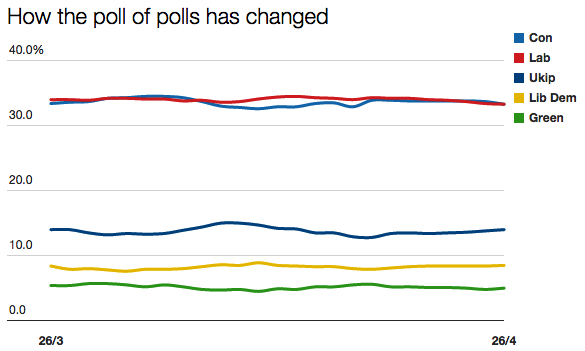 Ukip has edged back up again after seeming to embark on a downward trend in early April. Meanwhile the Lib Dems and the Greens are still hovering around their respective averages of 8% and 5%. The fact that nothing is changing is still significant, of course. All the main parties appear to have flung everything in their armoury at the electorate and at each other, yet as far as the polls are concerned, it’s all been to little effect. What “surges” there have been in individual polls have only ever been sporadic and are being cancelled out within 24 hours or so by other polls showing movement in the other direction. Taking the numbers at face value, it seems there has been no swing back to the governing parties in the lead-up to the election, as predicted by some newspaper commentators and pundits. But the numbers do not reflect what may or may not be happening at a constituency level. And herein lies the biggest tease. Just what is really going on beneath the surface of the poll figures? And how much of a difference will there be compared with the shares of the vote on election night? I suspect the answer to both questions is: more than we think.